Heirloom quality handcrafted hardwood products that make family memories that can last for generations. 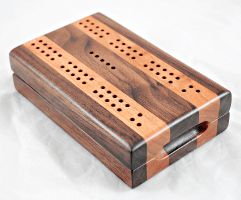 Bark Up A Tree Woodworks designs hardwood cribbage boards and unique custom cribbage boards that can be passed down for generations to come. 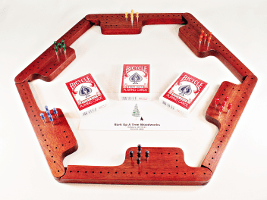 Our solid wood boards allow friends and families to spend countless hours being entertained and building memories. Enjoy this American game with friends and family. This game is a variation of the games Sorry and Aggravation. Instead of using dice, playing cards are used in their place. Made popular by campers because of its compact size, this game has brought countless hours of pleasure to those who have played it. At Bark Up the Tree we are known for our quality handcrafted products. We select the finest wood to build long lasting and memorable boxes of all types. 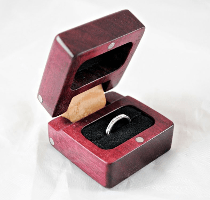 We create wooden ring boxes that are often presented during wedding ceremonies. The beautiful wood grain boxes bring a special elegance to any occasion.